Despite what you may hear in suburban America, Black walnuts are not the nuisance we are taught to believe they are. The Eastern Black Walnut or Juglans nigra in Sciencese, is one of the most calorie dense foods in North America! Boasting an impressive 189 calories in a quarter cup of nuts (source). In cases of survival, this wild (or planted) food is almost unparalleled! In fact, if you could only pick one nut to have access to in a survival situation, I would always say that you should choose Black Walnuts. Now I know that in order to appear legitimate, I should tell you all how to identify Juglans nigra, but it almost seems useless to do so. Seeing as how ubiquitous this tree is in its native range, and how ubiquitous it has become outside of its native range, telling you how to identify a Black Walnut would be akin to telling you how to identify a squirrel. There are thousands of online guides that teach people tree identification. If you cannot ID this tree, go to one of these websites and come back here for the stuff beyond the usual. Where I live, Traverse City Michigan, these trees are planted on every single street. While that may not seem very interesting, I am often interested in back stories of plants that are heavily planted outside of their native range. As it turns out, before you could go down to your local Walmart and buy corn syrup flavored everything for 98 cents, there was a common consensus that our yards should have food producing trees in them. Hence Traverse City having an extremely robust population of Black Walnuts, even though they are not "native" to this patch of dirt. While I am indeed a fan of grocery stores, I am more a fan of eating local food that requires zero inputs to have a good crop. Often while driving around town in the fall, and seeing yards full of nuts that no one is going to eat except the squirrels, my mind wanders back to a time when people would have collected these amazing nuts and probably shot every squirrel trying to steal them. The robustness of our ancestors is so very awe inspiring to me. Squirrel hunting aside, Black Walnuts would not have laid around in peoples yards a hundred years ago. Nobody back then would have regarded this food as in inconvenience to deal with. Far from whining about the fact that the husks stain things, people would be seen extolling the virtues of their amazing ability to stain things. Trappers would be looking to find husks to boil their traps in to mask the traps human odor. Medicine makers would have been busy tincturing and powdering the husks for their anti-parasitic and medicinal properties. Wool workers would be dyeing wool brown with these husks. And people all over would be seen carrying the characteristic stained hands of fall as most folks would have had some contact with these wonderfully staining husks. The era that we live in now could be considered a time of great fortune and privilege by some accounts. We have the great fortune to whine to our neighbors about trees that would have one hundred years ago been a great blessing. Make no mistake about it folks, it is a blessing to be able to ignore something so life sustaining. In hunter-gatherer times, a bad walnut year could have meant starvation for those that depended upon them for food. All of this is to say essentially that we have a gem hidden right before our eyes, and we often ignore it. This is all very impressive to say the least, but lets not forget the fact that all walnuts (genus Juglans) contain substantial amounts of ALA or Alpha linoleic acid. This is an Omega 3 fat that is essential for brain and heart health. Now before you go jumping for joy, remember that ALA is a precursor to DHA and EPA but the conversion rate is extremely low, often as low as 1%. (source) Either way you look at it, getting some of this essential fatty acid into the body is an important part of every diet, so even eating little amounts of it are important. Especially for children and their growing brains. Any coverage on nuts would not be complete without at least a nod to phytic acid. Phytic acid or phytate is a plant substance that impairs the absorption of minerals like calcium, zinc and iron from the digestive tract. So if you do not first deal with the phytic acid present in Black Walnuts then you will receive almost none of the aforementioned benefits. So how do we deal with Phytate? This may seem like a daunting task, and it may scare you away, but it should not because people have been eating nuts for a very long time and we are the evidence that it did not in fact kill them. The most simple way to avoid eating excesses of phytate in the diet is to avoid all raw nuts. Yes, you read that correctly. Despite current fads advocating for the consumption of raw nuts, all evidence shows us that consuming raw nuts can be a real health hazard. Too much phytic acid has been linked to dental health slowly falling apart, no matter how much you use that brush. So the simple answer for most of us is just to roast the nuts before you eat them. Roasting very effectively rids the nuts of excess phytates and it is also a way that has historical roots. Humans have been eating roasted nuts for as long as we've been human. The other method for banishing the phytic acid that is very popular, but lacking in historical practice, is to soak the nuts for a period of 6-24 hours. This method is used to get the nuts to sprout slightly, thus lowering their plants defenses, in this case being the phytic acid. 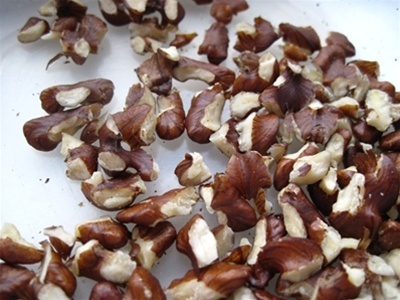 This method works well, but I am not a fan for one major reason: A large majority of the nuts that people crack break into pieces and so are no longer viable seeds to germinate. I have absolutely zero scientific evidence that this impairs the lowering of phytic acid, however I do know that this impairs seed sprouting, and so it leads me to believe that this method would have no effect on phytate. Unless of course you are an expert nutcracker that always ends up with whole nuts. All walnuts have the benefits listed above, no matter the size. But that does not mean that all walnuts will crack the same. Harvesting small walnuts is often times a huge waste of your time. First of all, the walnuts are actually smaller and thus you get less return for each individual nut cracked. Secondly, smaller walnuts are physically harder to crack, and still retain a walnut that has not been smashed into flour. While with the bigger shells you get out more whole nuts, and pieces without the hulk-smashed look. So if you live in an area with a lot of walnuts, I say be picky. If you go up to a tree and you feel that you could do better, then by all means move on. Chances are you will find a better tree. Although I fully admit that I have (in bad years) picked from trees with tiny nuts. Finding Black Walnuts is a relatively easy prospect nowadays. They are planted widely in cities and in the country alike. It is not uncommon to see Black Walnuts even planted in the middle of corn fields. Now if you happen to travel back in time, and fancy a walnut or two you would look in a Black Walnut's natural habitat which is in riparian zones, or near rivers. Black Walnuts are fond of good rich soil that is often wet or at least retaining some moisture. Their old native range before extensive planting outside of that, was roughly from southern Ontario to southeast South Dakota, South to Georgia and Northern Florida, and southwest to central Texas. As mentioned before, I live in a place crawling with Black Walnuts, and yet I am out of its "native" range (whatever that means). So now that you have a big ol' pile of nuts you have chosen to eat, what do we do with them? First off, ignore all people that tell you to run over them with your cars. This is unnecessary and very typical of american ideas about speeding things up. One thing I can really appreciate about these nuts is that they ease us back into slowing down. At least a little bit. There are plenty of online resources for how to handle Black Walnuts, but my preferred method of dehusking is as simple as pouring a large pile onto a cement pad near you and rolling them under your shod feet one by one. Yes, this method does take some work, and it requires you to move your body, and bend over and pick up nuts that will stain your fingers. But it is so fast once you get the hang of it, that I have yet to see someone do it faster (with just their body parts). I can de-husk a five gallon bucketful in about 7 minutes or so. Processing Black Walnuts by the 5 gallon Bucketful is my preferred amount to process at a time. Firstly, the bucket is convenient to carry. Secondly, once the nuts are de-husked you can use the very same bucket to move onto the rinsing segment with. A five gallon bucket, full of Black Walnuts with their husks on, will reduce to approximately 1/5 or 1/4 of the size of the interior of the bucket. This is a very convenient amount to wash at one go. Washing the Walnuts is done in repeating steps. I usually do 4-5 wash cycles. Take your de-husked walnuts to the nearest spigot and fill to almost full. The water should be a very dark brown or even black at this point. Stick your hands into the bucket and start swirling the walnuts around vigorously for a few minutes in either direction. Owing to the fact that the shells are very coarse on the outside, this swirling method (I have noticed) rubs off a lot of the remaining husk that still clings to the exterior of the shells. Pour out the water and repeat until the shells appear to be pretty reasonably clean of husk material. This typically coincides with the water being only a yellow color and no longer brown or black. As a side note, do not pour this water anywhere near your garden or any worms that you desire to still be alive. The water from Black Walnut cleaning is actually capable of killing some plants and I almost always see dead worms in the areas that I pour out this water. Now that you have cleaned shells, it's time to get to drying the shells to prepare them for their final storage. There are two methods usually employed for this; sun drying, and heat drying. I almost universally choose the latter because where I live leaving out cleaned Black Walnuts would be like putting up a sign to the local squirrels that reads "Free Nuts Available Here!" I in fact just talked to someone this morning that had her cleaned Black Walnuts stolen from her porch. Unless you plan on being outside, ready to hunt, it makes far more sense to just put these nuts near a heat source to dry. For me, because I do not have a wood stove, this means drying them in batches on pans in the oven on low with the door open. Remember, we are drying these nuts, not cooking them. Closing the oven door might accidentally cause your nutmeats to cook, and that could case them to turn rancid. After you have successfully dried out the outside of the shell, your nuts are ready for storage. I typically will dry my walnuts for a period of about 2 months before starting to crack them, and the reason for this is simple: Fresh black walnuts taste wretched. Like somebody made a bubblegum out of fake vegan cheese. So I wait, and the flavor morphs into an amazing nutty flavor unlike any other nut out there. Very strong and flavorful. Cracking these nuts is the most difficult part of the job. The debate is constantly going about how to crack them, with new nut crackers coming out yearly. Some people even squeeze them in a vice (which sounds like it must take forever). I have been eating these nuts for a long time and have yet to find anything that works better than a slab of cement and a hammer, and some good skills with that hammer. I have yet to meet a person that can get out nuts as fast as I can or with as many whole nutmeats, and I never use a nutpick. I have been working on my technique for a very long time, and I feel that anyone could learn with a little practice. First take a hold of the nut with one hand with the line of the nut running up and down. Holding the hammer in the other hand begin to strike the top part of the nut. Once the nut cracks into two or four pieces you should find a center connecting nut piece. Take each half or quarter and break down from there. Placing a quarter nut on a slight angle upward (very slight) strike the corner of the nut, this should break off the face and open the nutmeat up for grabs sans nutpick. While it is uncommon, do not eat shriveled or nasty looking nuts. So there ya have it folks. Black Walnuts, in a nutshell! If you found this blog entertaining or exciting and you would like to help me out so that I can have more time to write more stuff like this, please go to my Recommended Foraging Stuff page and bookmark it or shop directly through these amazon portals. I receive a tiny portion of what you buy and it doesn't cost you a dime! Thanks for reading! Comment below!